Hector Velazquez, creator of “Hector’s Shop,” is the winner of the 2018 Edwin Budding Award from the Golf Course Superintendents Association of America (GCSAA). The Edwin Budding Award, named for the inventor of the lawn mower, is given annually to an equipment manager or related innovator, technician, educator or engineer who has made a significant impact in the golf and turf business. 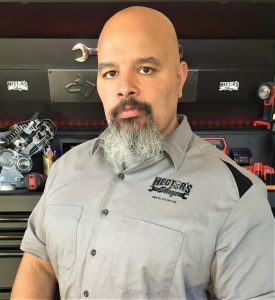 Velazquez nicknamed “The Tactical Technician,” began his career as a certified motorcycle technician more than 20 years ago. He is also a videographer and video editor and produces educational videos in a series called “Hector’s Shop,” which teaches equipment technicians new skills. He also produces instructional videos for Home Depot’s tool rental department, mom and pop shops and for his own website. Velazquez will formally receive the award at the 2019 Golf Industry Show in San Diego, where he will be recognized at Inside the Shop on Feb. 6, at 11:30 a.m.
Velazquez has won several awards for photography, video and multimedia from TOCA (Turf and Ornamental Communicators Association). He also offers onsite tech training, shop organization consultations and speaks at hands-on style classes. During the 2019 Golf Industry Show, Velazquez will be hosting The Tactical Shop Series within the Inside the Shop area on the trade show floor. The Golf Course Superintendents Association of America (GCSAA) is a leading golf organization in the United States. Its focus is on golf course management, and since 1926 GCSAA has been the top professional association for the men and women who manage golf courses in the U.S. and worldwide. From its headquarters in Lawrence, Kan., the association provides education, information and representation to nearly 18,000 members in more than 78 countries. The association’s mission is to serve its members, advance their profession and enhance the enjoyment, growth and vitality of the game of golf. Visit GCSAA at www.gcsaa.org, or find us on Facebook or Twitter. Visit our industry-leading magazine at GCMonline.com. The Environmental Institute for Golf is the philanthropic organization of the GCSAA. Its mission is to foster sustainability through research, awareness, education, programs and scholarships for the benefit of golf course management professionals, golf facilities and the game. Visit EIFG at www.eifg.org, or find us on Facebook or Twitter.